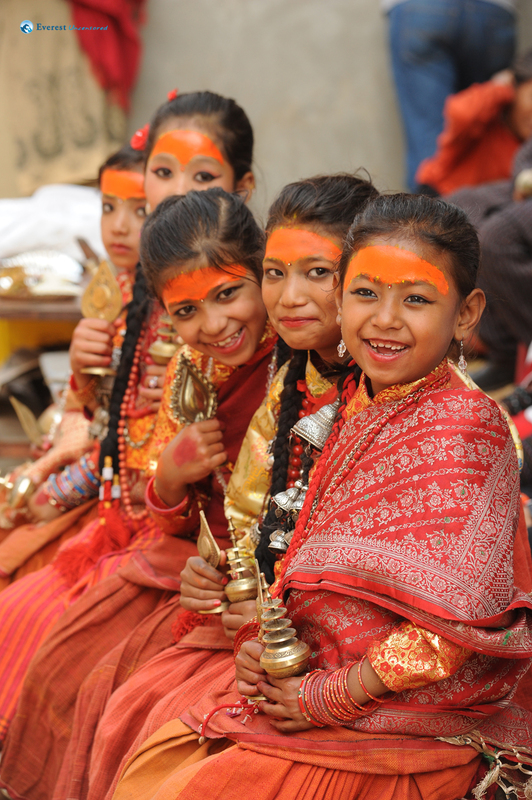 The photo was taken in Bubahal, Lalitpur during a community ‘ihi’ or ‘bel bibaha’ ceremony. Girls of ages 5,7,9 and 11 are allowed to participate in this ceremony. The participants are left unaware that they are participating in a ceremony which is in theory their “first marriage”. Thus, they are dressed with the clothes and ornaments like a Newari bride. In the Newar community, there is a unique tradition of marrying a female child to the bel fruit (wood apple). One must be familiar with the term ‘bel bibaha’. 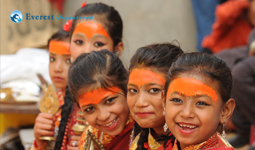 The marriage between a virgin Newari girl and bel fruit is held before the girl attains puberty. This ensures that the girl acquires active and healthy reproductive powers. In this marriage ceremony, known as ‘Ihi’ in Newari, the bel fruit must look rich and ripe and must not be damaged at any time and in any ways. If by chance the fruit turns out to be a damaged one, it is believed that the girl or the bride will be destined to spend the rest of her life with an ugly looking unfaithful husband later in her real life. So any female colleagues in Deerwalk who have participated in ‘ihi’ or ‘bel bibaha’ in childhood, hope you guys remember how your bel fruit (wood apple) looked like.